ST. GEORGE – The St. George Police Department announced Monday that a burglary suspect has been positively identified and arrested thanks to an overwhelming response from the public in helping identify the alleged suspect through photos. The Police Department initially issued a statement Thursday seeking the public’s help in identifying the suspect. The man, identified as 19-year-old Vincent Damian Trout, of St. George, was subsequently located and apprehended Saturday after police followed up on tips provided by the public. Trout is suspected of being involved in a Jan. 31 vehicle burglary in St. George during which two finance cards were stolen, St. George Police Detective Terrance Taylor said in a probable cause statement supporting Trout’s arrest. The owner of the finance cards discovered one of the cards had been used to make purchases at a Maverik gas station and a Redbox kiosk, the statement said. Detectives obtained video surveillance footage from Maverik and captured digital still photographs of a man who entered the business and used the finance card. After asking for the public’s help in identifying the man in the surveillance footage, Taylor said, police received multiple calls from tipsters identifying Trout as the man in the photos. A witness reported seeing Trout Saturday, and police were able to make contact with him. 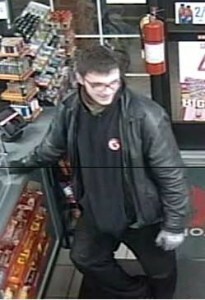 Trout who was wearing the same glasses, jacket and shoes pictured in the surveillance photos, the statement said. “(Trout) was detained and I conducted an interview with him in which he confessed to knowing the finance card was stolen and confessed he had been an accessory (look out) in committing the vehicle burglary from where he had obtained the stolen finance card,” Taylor said in the statement. 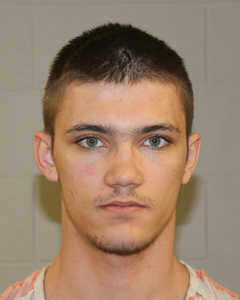 Trout was arrested and booked into the Washington County Purgatory Correctional Facility. He was charged with one third-degree felony for unlawful acquisition of a finance card; a class A misdemeanor for vehicle burglary; and a class B misdemeanor for making a purchase with the stolen finance card. “The St. George Police Department is extremely grateful for your assistance in this case,” the Police Department said Monday in a statement released to the public. Yeah the law in Utah doesn’t exactly pertain to everyone does it.? Wearing the same glasses and clothes, thats picture perfect! He’s really not that bright. Good thing they caught him before he moved to Phoenix. I highly doubt law enforcement would have extradited him from Phoenix.